Top marketers today don't shy away from financial accountability. In fact, they actively seek to account for the return on their companies' investments in marketing – because they want their budget to make a difference for their brands and for their business: more relevant messages, more effective campaigns, more satisfied customers, more profitable promotions, higher returns to shareholders. If this is how you think about marketing, this book is for you. It is a book for CMOs who adopt an investor's mindset, and it deals with the most pressing marketing performance questions. This isn't a work of theory. This is a hands-on guide to better marketing for top managers, neatly packaged into ten concise chapters that are just right for a short-haul flight. 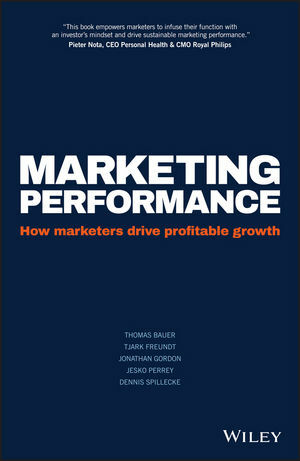 Marketing Performance delivers expert insight, a wealth of proven success factors, and real-life case studies that will help you drive marketing performance and grow your business. THOMAS BAUER joined McKinsey in 2001 and is based in Munich. As a Senior Expert in McKinsey's marketing strategy group he serves clients across industries and geographies on topics such as marketing spend effectiveness and brand management. Thomas co-leads the Marketing Navigator, a McKinsey technology solution for marketing performance optimization. TJARK FREUNDT is a Partner in McKinsey's Hamburg office. He joined McKinsey in 2001 and is co-leader of the EMEA Marketing and Sales Practice. Tjark leads McKinsey's global service line for brand management and marketing effectiveness. His main areas of activity are logistics, energy, and chemicals. He is the author of many articles and books such as Power Brands. JONATHAN GORDON is a Partner in New York. He joined McKinsey in 1995 and is the leader of the global marketing strategy service line. He helps consumer companies construct marketing strategies and build capabilities that drive top-line growth, spanning financial services, packaged goods, and automotive. JESKO PERREY is a Senior Partner at McKinsey and based in Dusseldorf. He joined McKinsey in 1999 and is global leader of the Marketing and Sales Practice. He serves clients across multiple industries and a broad range of topics such as commercial transformation, marketing ROI, branding, customer experience, digital marketing, and advanced analytics. He is the author of Power Brands and Retail Marketing and Branding. DENNIS SPILLECKE is a Senior Partner at McKinsey and based in Cologne. He joined McKinsey in 2001 and is leading the German Marketing and Sales Practice. He serves clients across multiple industries and a broad range of topics such as advanced analytics, commercial transformation, marketing ROI, branding, and digital marketing. He is the author of Power Brands and Retail Marketing and Branding. How should I shape my messages? How will I reach my target group? How do I ensure excellence in execution? How can I drive change and sustain impact?